We’ve read that the Ourcast app predicts rain and snow with "unprecedented accuracy." Can you tell me more about what’s been done to test and verify this accuracy? The biggest challenge is in making an accurate correlation between what radar is showing and what is actually happening on the ground in terms of rain observations. We found that when you can correlate the past behavior of the radar with past rain observations, you get a much better indication of precipitation. Our accuracy refers to the ability to correlate the radar to a rain observation. It comes as a surprise to a lot of people that radar is a technical signal and while a good indicator, it’s not always directly correlated with what’s happening on the ground. It sounds like statistical modeling is a major part of the app. How much meteorological knowledge was used in developing the app? We found that if you’re going to predict the next two hours of precipitation, the dynamics associated with a statistical model are better than a meteorological approach which would include a numerical weather model or a mesoscale model. 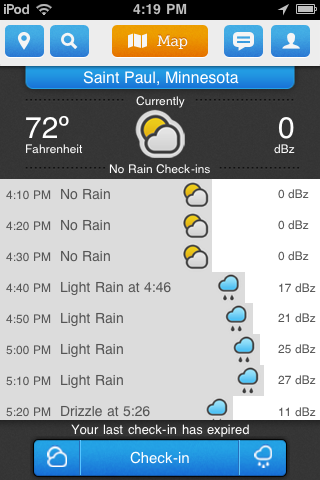 Do you envision your app being used more by weather enthusiasts or common folk? Both. We’re definitely focused on the typical consumer that’s not a weather enthusiast. We think that’s where the biggest gap is in peoples’ ability to use the weather forecast in the short term. We want to give those people that ability. But weather enthusiasts should find it useful as well as it can help them determine when radar is really describing precipitation on the ground. Ourcast makes use of “check ins” as a component in the app. What do check-ins provide? Check-ins are user reports about what is going on on the ground. The more information that users provide, the more we can build on our accuracy. Check-ins also provide a social aspect to the app by providing an ability to discuss weather with people near you. How dependent on check ins are you for accuracy? We launched with a product we think is accurate. It will get more accurate as our community grows. Check-ins and user reports help us to tease out what’s ground precipitation from what’s clutter, ultimately adding more accuracy. The way that we correlate radar to precip is through a large set of weather stations located around the U.S. This includes backyard weather stations, government sources, proprietary sources and Weather Underground stations. This provides real-time information and gives more accuracy, almost to neighborhood level reports. These weather stations also provide more data beyond precipitation including temperature and wind speed. We try to be as accurate as possible. However, we have built in a slight bias for overprediction. We think people would rather be warned more than warned less – they’d rather be warned of rain that doesn’t happen than rain that comes without being predicted. In other words, there’s a bias to false positives more than false negatives. How far out does the forecast go? In general, our forecast window is two hours. However, depending on when you check it, you may catch the system in a cycle and it can be a little less. But it should always provide at least a one hour and 40 minute forecast. Beyond two hours, the model right now degrades, and at that point mesoscale models and traditional numerical models become better. Are there locations where the performance of Ourcast is less reliable or precipitation patterns that are more problematic? There are regional issues such as where the radar signal is weakest or concentration of ground stations (for observations) is weakest. Mountainous regions have a lot of radar blockage and also tend to have fewer ground observations because of less population. There can also be issues with storm types. Storms that are strongly delineated, have a defined leading edge and are part of regional fronts usually provide the most reliable accuracy. Light snow in winter can be more of a challenge. However, as we grow our community it will mean a system that’s less reliant on radar and we’ll be able to build a forecast that’s more robust. What do you consider the strengths or uniqueness of your app? We’re unique because of a combination of a strong forecast system and a strong social app. We’ve designed it to have both. When you can make it more interactive, fun, social, etc., it takes on a new dimension. The social aspect can mean that even when plans are cancelled because of the weather, it can be a more fun, social experience. We want to keep making the app more interactive and fun. We want to add the concept of rankings and badges, so that users who report will get rewarded more. We are also working to provide an alert for users that will warn them ahead of time when precip is coming or when it’s about to end. We think that will really help to add value to the product. In testing the app on an iPod Touch, we’ve had a few instances when “low memory” issues have caused the app to crash. Is that unusual? No, it’s not and that’s because the app is not made to perform on the iPod Touch but rather on iPhones. However, it can still work on an iPod Touch but it may have some bugs until we support that platform more effectively. The app categorizes rain into drizzle, light rain or heavy rain, but there’s no designation for moderate rain. Is that by design? Yes, that’s by design. We want to keep things simple and just have a few separate categories. The app includes dBZ levels that reflect the intensity of precipitation, so people can see the see the relative changes in strength of precip over time.